This was the first time I've seen Ibsen performed! Well, I did play Christine in my high school One Act competition production of A Doll's House. Ugh, I had to have an onstage kiss with Edward! 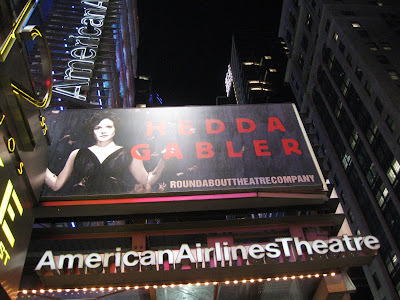 So, I had a feeling that Hedda Gabler would be dark and possibly tragic and I was not far from the mark. However, I didn't realize that it would be funny. Was it supposed to be? The audience was certainly laughing. I really enjoyed this Roundabout production starring Mary Louise Parker, Michael Cerveris, Paul Sparks, Peter Stormare, Helen Carey, Ana Reeder and Lois Markle. Mary Louise's delivery was so scarcastic and her portayal of a trapped wife Hedda was palpable. It's funny that I think she was trapped because she was pretty much in charge and boy, did she know how to hurt, both herself and those around her. Was she escaping a bad situation or settling or what? Anyway, she looked beautiful in the period costumes by Ann Roth. Michael played Hedda's husband as a henpecked boring dolt just fine and I was excited to see him in a rage - I saw Sweeney coming out! Peter Stormare was weird and creepy, just like I've seen him in the movies (OMG he was in Dancer in the Dark!). The rest of the cast was fine. There was nothing thrilling about it, but it was definitely enjoyable. It seems like most people hate it, but perhaps the pre-show glass of wine and the grain of salt helped. And oh, we had great seats just two rows behind Miss Whoopi Goldberg! If we had been just a row behind her I would have touched her hair. As it was, I tried to run up behind her, but Kari wouldn't let me.